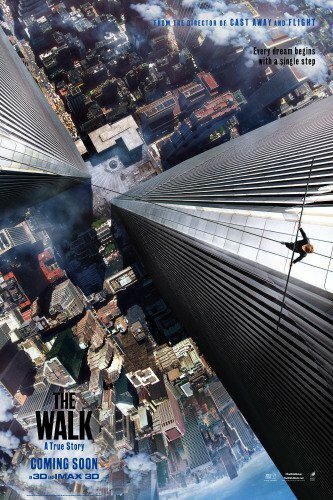 Robert Zemeckis’ The Walk is a fictionalised telling of the amazing feat performed by French high-wire artist Philippe Petit (Joseph Gordon-Levitt) when he illegally put a wire between the twin towers of the World Trade Centre in New York and walked across it. This particular story was the subject of the critically acclaimed documentary Man on Wire in 2008 so it might initially seem confusing as to why there would need to be a fictionalised telling of it at all. I suppose the cynical answer is because there’s money in it but the less cynical answer would be to open up this story to an audience who are perhaps not quite as interested in documentaries. Zemeckis chooses to tell this story without getting bogged down in too much realism. Tonally there’s an optimistic children’s storybook quality to the narrative and the characters are all played as a little bit larger than life. Any jeapordy is removed by Petit serving as the narrator of the piece as he stands atop the Statue of Liberty recounting his tale to us willing audience members. Removing the jeapordy early on is a good choice as it allows the film to play out as a solidly fun family film. Nothing about the subject matter has any darkness or impending doom to it so it’s something that should interest parent and child alike. There’s a lot to like for those willing to have a good time. Joseph Gordon-Levitt is wonderfully eccentric in the lead role despite his sometimes laughable French accent. Petit is somewhat lacking in depth thanks to the script glossing over his early life and keeping his focus limited to one thing but there’s no denying that his performance is an awful lot of fun to watch. There’s a good energy to Petit that becomes more infectious as the film goes on. His best developed relationship is with another performer called Papa Rudy who mentors him and develops a fatherly bond with him over time. Again, it’s not especially deep but there are some touching scenes racing swiftly past while the film tries to get onto the next thing. It’s a lot better developed than the relationship with Annie (Charlotte Le Bon) who does a good job but doesn’t have an awful lot to do other than fulfil her standard role as the supportive yet concerned love interest. Similarly his other accomplices in achieving his illegal dream are saddled with one character trait that ends up defining them. Essentially, the relationships featured only develop in relation to Petit’s dream which explains the superficial nature of them. None of that really matters as the film hangs together really well. Everyone involves plays their part in the adventure and not a lot else but the focus is kept on Petit as this is his dream and it must be achieved. Structurally the film plays out a bit like a heist from the planning to the execution and the complications that inevitably arise despite all the careful preparation. It’s a fun experience to watch them meticulously plan every little details and it only hammers it home how profound an achievement this historic wire walk really was. Every scene in the film builds up to Petit’s walk across the wire so the narrative focus is very tight with very little dead weight slowing the pace down. Some scenes could have been shorter but on the whole I was completely on board for this right from the beginning. Despite the fact that it’s made clear that there is no jeapordy involved in the walk itself I found the viewing experience very nerve-racking. I saw this film in IMAX -which is to my mind the only way to experience it for the first time- and I found my fear of heights really kicking in more than once. On one hand there is such beautiful imagery as Petit literally walks on top of the city but on the other it’s incredibly terrifying to look at. By the end of the sequence my nerves were absolutely destroyed despite the fact that I knew there was no danger involved. I’ve always thought that Zemeckis was a master of tension as evident in is Back to the Future trilogy among other things and this film is just another shining example of this. On another note this film is a really powerful tribute to the twin towers themselves. Naturally 9/11 lives on in infamy to this day and will no doubt be something referred to as historic in the years to come so to see such an optimistic tribute to a great symbol of New York is fantastic. This is a fun story that is very well told and easy to recommend despite the characters somewhat lacking in depth. Lots of fun for the whole family. A fun and engaging film that gives an optimistic take on a historic attempt to realise a lifelong dream no matter the cost. Joseph Gordon-Levitt turns in an excellent performance as the lead Philippe Pettit. He seems a little larger than life and is somewhat lacking in depth but the fun factor and his energetic performance more than make up for this. Every scene in the film is focused on him achieving his dream and the relationships he has with his girlfriend Annie, his various accomplices and his mentor/father figure Pap Rudy. Structurally the film plays out a little like a heist. We’re taken through the planning stage right to the attempt where things go wrong that force the plan to change. It’s fun to watch and kept me entertained throughout. Despite the lack of jeapordy due to the film being narrated by Petit after the fact the wire walk sequence still manages to be perfectly tense. Zemeckis has always been a master of tension so it’s great to see that his skill hasn’t worn off throughout his career. This is definitely worth a watch, particularly in IMAX. It’s fun, optimistic and easily accessible for the family.